Facts and information are necessary resources when making decisions and setting a direction. How does one acquire the facts? A common thread is to look at both external and internal environments. 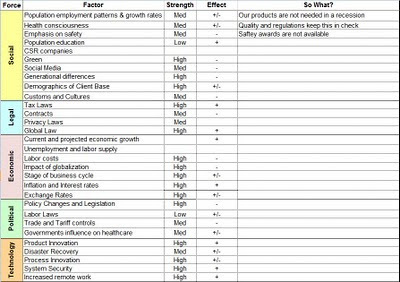 Interestingly enough, even though external factors seem like they would be much more expansive, I believe they can be summarized without too much trouble. The resulting internal analysis helps determine whether an organization should adapt to the external environment, or change the external environment. There are Macro and Micro external environments. The macro environment is comprised of social, legal, environmental, political, and technological factors. This is known as a SLEPT analysis, although other acronyms like PEST, PESTEL, STEEPEL, and others exist. Picking one of these acronyms is usually sufficient because as it is, an issue could fit into more than one bucket (eg. social and environmental). The important thing is not what buckets you use or where the items go; It's that you see all the items. The micro environment is comprised of a framework coined by Michael Porter from the Harvard School of Business. It's called Porter's 5 Forces. Porter believes that the micro external environment is driven by a small number of critical determinants which he refers to as forces. 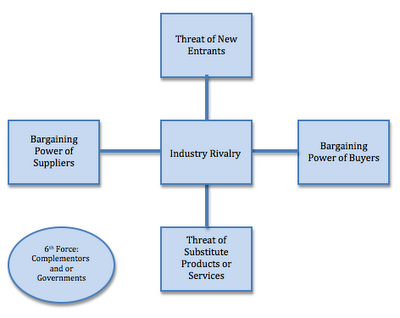 These forces include the threat of new entrants, current rivals, the power of suppliers, the power of buyers, and the threat of substitutes. Many people have added to this list government policy and compliment products. I think the definitions and short descriptions given of macro and micro analysis are sufficient to get started with the collection of facts. The internal environment however, is a little more complex and harder to explain. There are several methods that include a resource based view, functional based view, building blocks of competitive advantage, value chain, and Hamel and Prahalad's competency matrix. All of these except two are different. These are not the only methods. Other ways to evaluate environments include looking at the industry's maturity in its life cycle and growth curves for a type of product. Given a reasonably finite amount of time however, only certain evaluation techniques can be used to make decisions and plan. If too much time is taken, opportunities will pass by and threats will overwhelm. Let us now look at these evaluation techniques in detail. 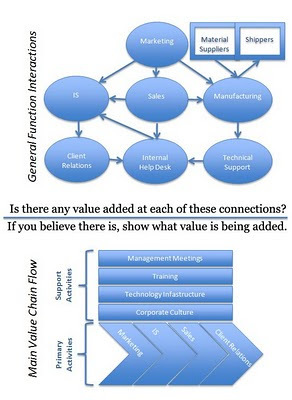 The value chain's purpose is to analyze how hand-offs between functions or resources are handled and what interactions take place between them. Specifically, the value chain's purpose is to make sure each hand-off actually adds some sort of value to the overall process. H&P's Matrix is really just four quadrants with one axis being old to new markets, and the other axis being old to new products. It is meant to determine what kind of innovation is taking place. The resource based view and functional based view has you list out either all the resources or all the functions and state whether each are valuable, rare, imitable, or fit the organization (VRIO). 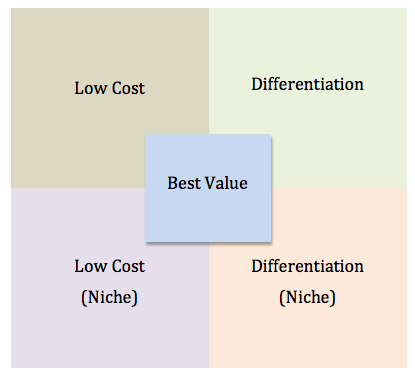 The building blocks of competitive advantage method has you state whether efficiency, quality, innovation, and response to customers fits in a low-cost, differentiation, niche low-cost, niche differentiation, or hybrid (best value) category. 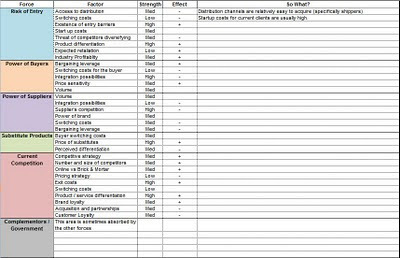 This is based on Porter's generic strategies. The generic strategies introduced by Porter attempt to identify a few main areas in which a company can decide to compete in how they positions products and services to the customer. The building blocks method helps identify which of Porter's generic strategies an organization is currently aligned with by looking at several concrete operational areas (Efficiency, Quality, Customer Responsiveness, and Innovation). So, as you can see, even though the external environment may be much larger than the internal, the internal seems to be more complex to analyze. I believe this is because most of the time you can only watch the external environment, while you have the opportunity to drastically change the internal environment. That is how you get the facts. We still however, must turn to making those facts useful. This takes the form of two popular frameworks: SWOT and scanning. 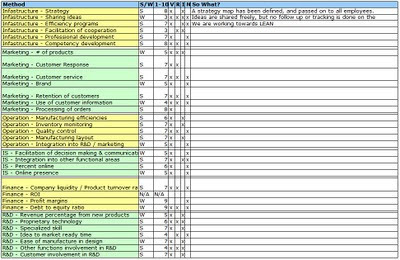 SWOT(Strengths, Weaknesses, Opportunities, Threats) looks at the external facts to determine threats and opportunities. It then looks at internal facts to identify strengths and weaknesses. You then have several options for the four lists you just made. You can compare strengths to weaknesses and opportunities, weaknesses to opportunities and threats, etc. One option is to match strengths to opportunities so you know what you should emphasize. Another option is converting weaknesses and threats into strengths and opportunities, but this usually means you're focusing on playing catchup to the competition. 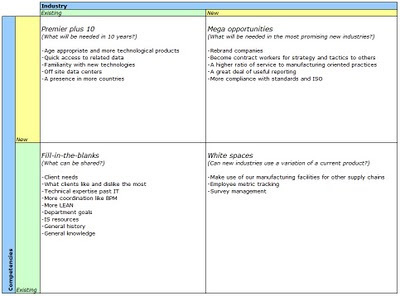 Creating a SWOT is really where you begin to see some lines created as to what should be focused on, and what should be filed away for later. Scanning is simpler and less formal. It involves finding and ranking opportunistic areas by asking, surveying, and creating hypotheses. You then work backwards, finding proof to back up your ideas. Once areas that require focus have been identified, either creating an in-depth implementation plan, or using scenario analysis (evaluating multiple alternatives) are the next steps. This is where the best strategy is discovered and its implementation becomes the focus. These ways of getting the facts have evolved from faculty, textbooks, trends, and experience. They're really the best way to do it.